I decided to go savoury this week. 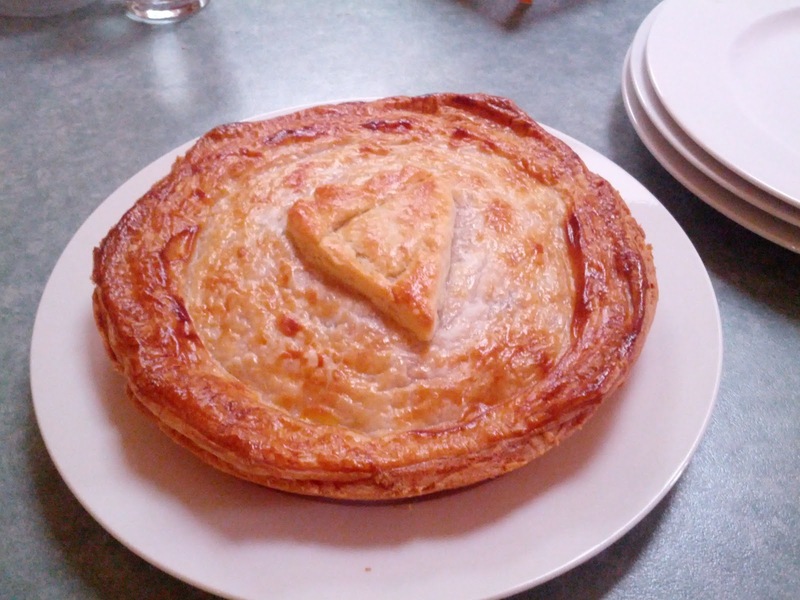 I spent a bunch of time trying to figure out which savoury filling I wanted and eventually settled on a chicken pie. I couldn't find a recipe that matched what I had in my head so I cobbled together some bits and pieces from a number of sources. The pastry recipe is adapted with my own notes from Stephanie Alexander's "the cook's companion." Buy some puff pastry. You need one sheet. Sift flour onto bench. Chop butter into little pieces over flour. Mix around lightly. Make a well in the center for the water. Mix water with the flour with a pastry scraper until combined but still rough and lumpy. Smear the dough away from you across the bench with the palm of your hand. You want chunks of butter spread out in the dough so don't mix too well. Gather it back together into a ball, flatten into a disk and cover with plastic. When it's time to use the dough, roll it out with flour sprinkled over it (generously if necessary) until it's a roundish shape bigger than your pie dish. You're aiming for about 4mm thickness. Place in pie dish, gently press into corners and trim off excess. The pastry will shrink a little during baking. Bake for 15 minutes. Remove the weights and bake an additional 15 minutes. Sprinkle some flour over the top of the mixture and stir through. Keep doing this until the liquid turns into a thick gravy. Paint the pie base with the egg white (leaving some) and pour in the filling. Fill up to below the side of the case - you don't want it at the top or it'll make a horrible bubbly leaky mess. The leftover goes nicely in toasties. Paint the edge of the case with more egg white. Place the puff pastry over the top. Press down to seal and trim off the excess. Paint the top of the pie with the egg yolk. Pierce the middle of the pie top with a knife to allow steam to escape. If you have some of the case pastry left over you can use it to make decorations for the pie top.